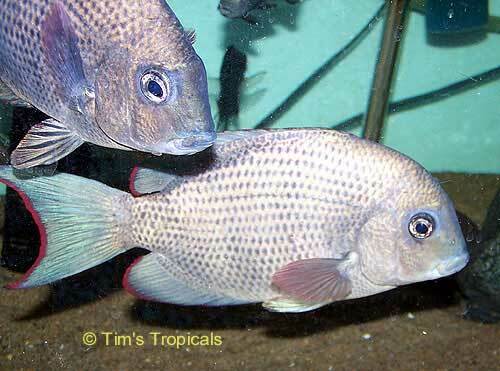 The Menarambo Cichlid or Pin Stripe Damba comes from Lake Sarodrano in northern Madagascar. It was discovered by Jean-Claude Nourissat and Patrick de Rham in 1992 and is now extinct in the wild. When young, Mearambo Cichlids are a pale gold with black dots in a pin stripe pattern. As they reach adulthood, around 4 inches or 3 years of age, they are blue/gray to almost white with black dot pin stripes. The fins are edged in red, especially the tail. 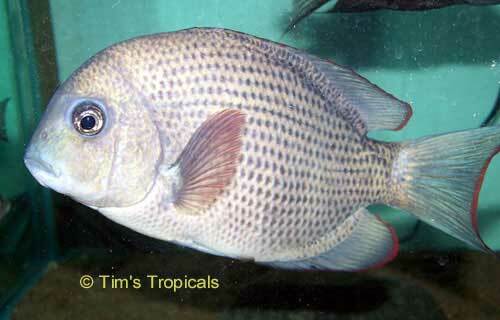 Your Menarambo Cichlid will need a large tank of 140 gallons or more. Keep them in schools of 6 or more to reduce aggression. The aquarium tank should provide fine sand, driftwood and stones. Menarabo Cichlids are indifferent to plants, but since they sift sand constantly, plants are not likely to survive. Menarabo Cichlids have teeth specially designed for crushing snail shells to obtain food. They will also eat frozen brineshrimp, bloodworms and daphnia. Male and female Menarabo Cichlids are extremely difficult to distinguish and to breed. Cold water changes and natural light may enhance breeding. When spawning, the pair will pale in color and darken on the underside with blue in the tail and face. They display with their head down and clean rocky areas. Menarabo Cichlids are a substrate spawner. The eggs are laid in a pit and will adhere to surfaces such as driftwood. 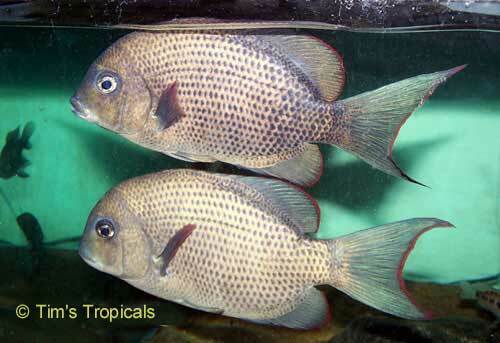 The Menarambo Cichlid pair should be separated for spawning, as the eggs are quickly eaten by other fish in the tank despite attempts by the parents to protect them. Some sources indicate the parents themselves will eat the eggs. Menarabo Cichlids can be hybrid with Paretroplus maculates.